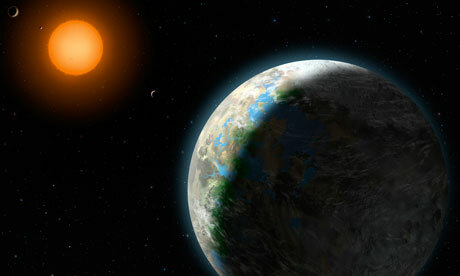 An artist’s impression of Gliese 581g, which astronomers say is near Earth – relatively speaking – at 120 trillion miles. Photograph: Zina Deretsky, National Science Foundation/APAstronomers have discovered a potentially habitable planet of similar size to Earth in orbit around a nearby star. The planet is in the “Goldilocks zone” of space around a star where surface temperatures are neither too hot nor too cold for liquid water to form. Unlike the previously discovered planets, Gliese 581g lies squarely in the region of space were life can thrive. “We had planets on both sides of the habitable zone — one too hot and one too cold — and now we have one in the middle that’s just right,” Vogt said. “Any emerging life forms would have a wide range of stable climates to choose from and to evolve around, depending on their longitude,” Vogt said.